Somehow the wind finally leads me to Bandung, the place where I spent years studying at ITB. While still trying to absorb all the deja-vu sensations (last time I was here, when I left the place, was 6 years ago! ), nothing beats having breakfast (and potentially also lunch and dinner later on) in one of those food stalls. Since I promised to write about my culinary excitement, here is one to pollute the planets (the aggregated blogs, not our blue marble): Kupat Tahu. 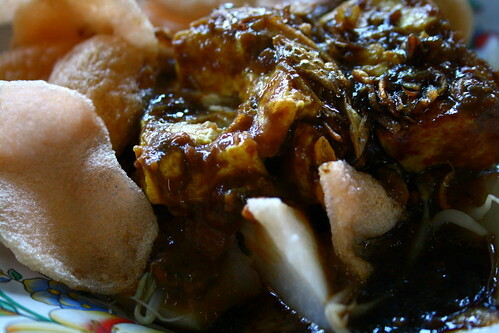 Essentially it is fried tofu, bean sprouts, and lontong (compressed rice) served with peanut sauce and some crackers. That makes it for a good breakfast. I will be in Bandung today and tomorrow, mostly just around the university. If you are around and want to have a chat, feel free to drop me an email! @stwn: It's Canon EOS 400D. Lontong atau ketupat (kupat), ya? Visual observations show that the two are different.